Walking home from Dublin City centre I used to cross every bridge from O'Connell to Heuston so I could look across the Liffey and enjoy both the North and South Quays. It added an extra half-hour onto the one-and-a-half hours the walk should have taken. Our buses to town always went along the Quays, and when you were young and waited by the dirty granite quay wall, you tried to bounce your spits down the wall into the Liffey below. This all added up to a generic painting called The Quay. Closer to Arran Quay and Eden Quay - or Bachelors' Walk before the erection of fake Georgian buildings - than to Inns Quay or Wellington Quay or Crampton Quay. 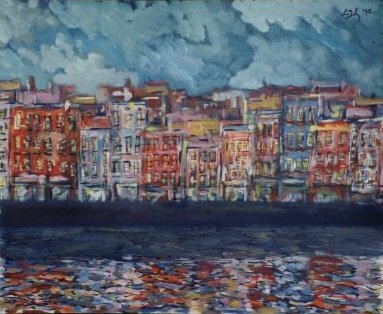 I do want to paint an entire series of all the quays. Just big enough to create a sense of space, the Liffey with its reflections was Dublin's first interactive urban facility.